M. Kibbe - Limited Edition #6/21! 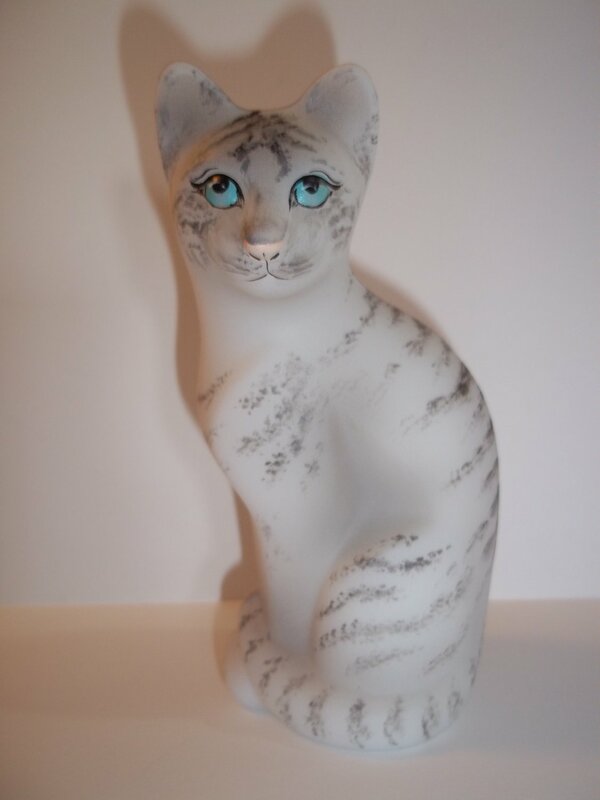 Here's a pretty Fenton stylized cat that was offered in very limited numbers as one of the last Fenton Gift Shop Exclusives in 2019. It is made of white satin glass and handpainted like a natural wild white tiger with beautiful blue eyes. It measures approximately 5" tall and is in excellent condition with no chips, cracks or damage. It is signed by Fenton artist and designer, M. Kibbe, dated 2019 and numbered #6/21. This amazing cat would be a great gift for your favorite cat lover! IT''S RAINING CATS & DOGS Humorous Tapestry AFGHAN THROW 54" x 70" USA MADE! Fenton Glass BLUE BURMESE SATIN LIGHTHOUSE Vase #3/30 Customer Appr 2012 Ltd Ed!